Miss M had her four month birthday last Friday, and the pediatrician gave her the thumbs up to start eating solid foods. We started off the first evening with brown rice cereal mixed in with her formula. Her first meal was one tablespoon. She thought it was a grand and remarkable adventure and ended up covered from head to toe with liquidy goodness. She went straight into the bath. The next meal I prepped a slightly thicker texture of brown rice cereal. It hadn’t previously occurred to me that in order to avoid allergy and digestive complications every food needs to be introduced one day at a time for several days. I actually think waiting in between new foods makes it so much easier; I only have to learn how to make a different puree every three or four days. After three days of brown rice cereal, Miss M got her first taste of avocado puree. This puree was a little more complicated to make, but I think that’s because I have a hand-me-down generic blender that dates from the 90s (before anyone actually expected blenders to blend things). I blended the raw avocado with formula, then pushed the whole concoction through a strainer. The resulting goop was adored by Miss M, who ate some and used the rest as a pore-cleansing face mask and hair conditioner. 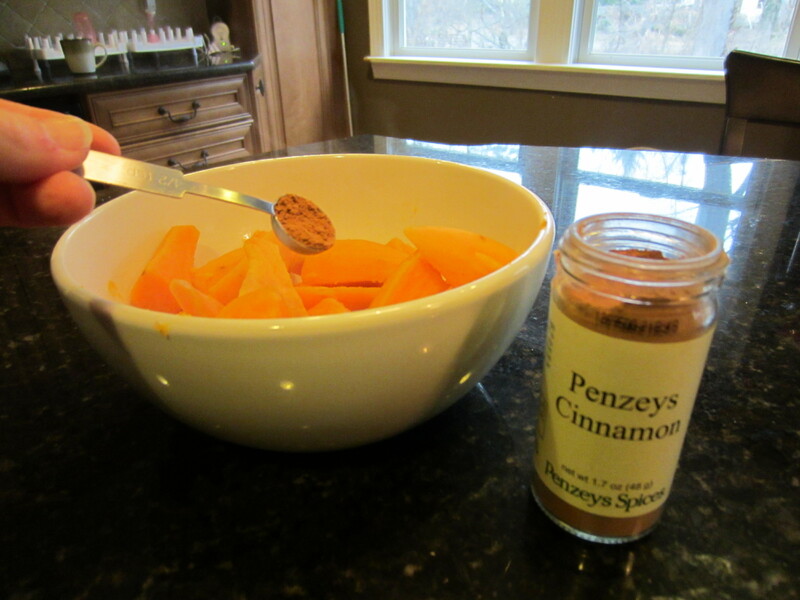 Today I tackled a cooked puree: sweet potato! 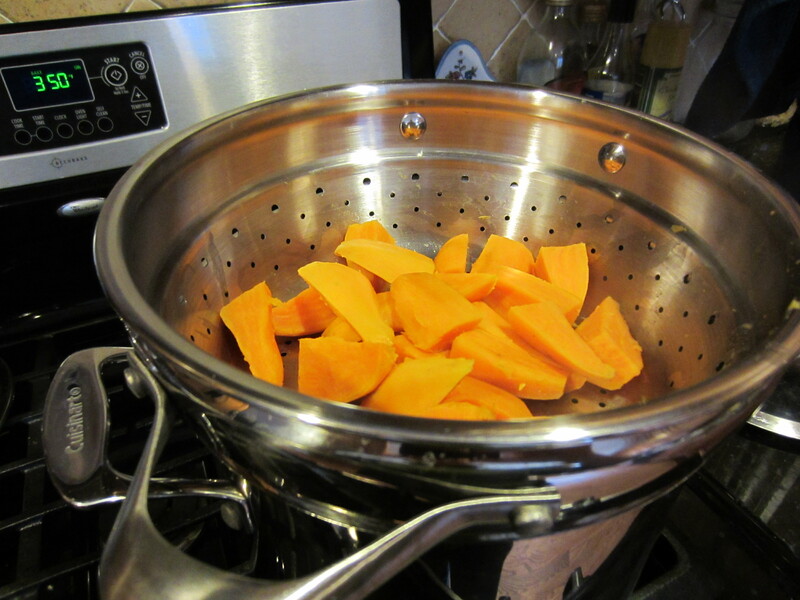 First, I peeled, chopped, then steamed three sweet potatoes. Then, I mashed them using a potato masher and added 1/2 tsp. cinnamon. I found these one ounce freezer trays with lids! Since the portions were going in the freezer, I didn’t add formula yet. Once they’re defrosted I’ll mix in the formula. I wasn’t fancy and just used a spoon to scoop the mashed potatoes into each section, but you could totally clip the end of a ziploc bag and squish it in so the process was a little less messy. I put the lidded trays in the freezer overnight, then ran some water over the bottoms to easily release the frozen cubes. 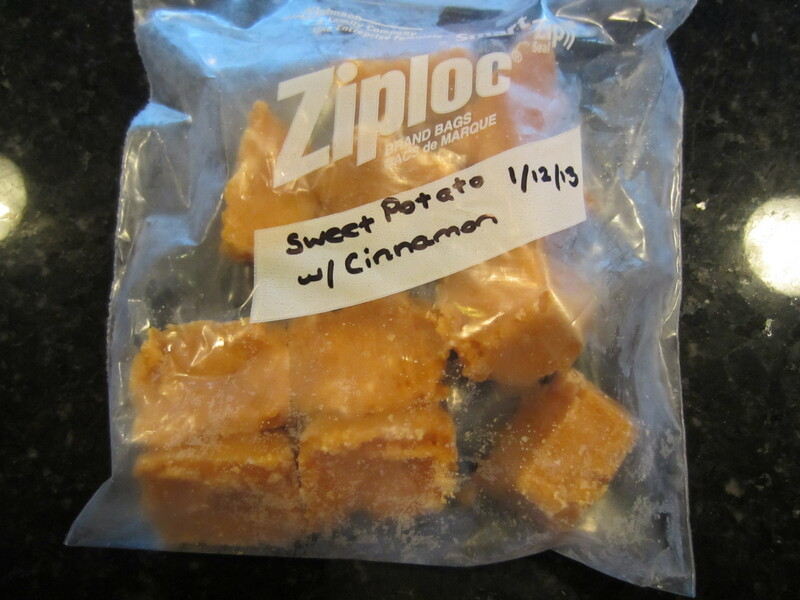 For now, I’m keeping each one ounce portion in labeled freezer bags. At our store, a 2.5 oz. container of mashed sweet potatoes was $.92, and I was able to make 24 oz. for a little over $3, so I’m excited about how much cheaper it was to make my own! For anyone interested in making baby food, I recommend “Great Expectations: Best Food for Your Baby & Toddler: From First Foods to Meals Your Child Will Love.” I’m sure there are lots of other good resources out there, but this is the one I used to get me started and it was really helpful. 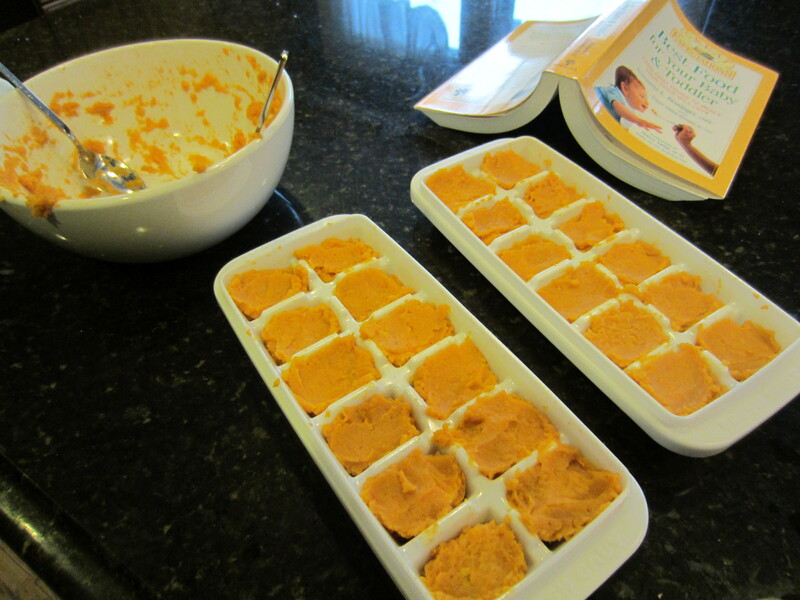 My daughter made all her baby’s food this way and the cubes are very convenient! Such a great idea. The addition of spices makes it all the more tasty for baby.